As I wrote, there were 250 comments below the report but, unlike the poll, the balance of support there had around 80% of those I could reasonably code utterly opposed to independence. Well that certainly gave me cause for thought. Will independence be good for Scotland? I’m not so sure now. 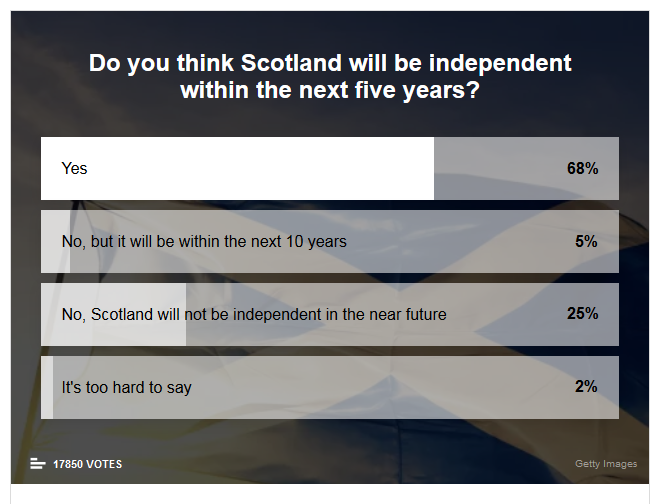 The percentage who said “No, Scotland will not be independent in the near future”, has decreased since I took part. If all the Natrolls voted in the poll too, no wonder they are frothing! It is several years since I even looked at a Hootsmon, (blood pressure) so I was surprised at how easy it was to take part in their poll. The one good thing about the Scotsman it tends to keep the deluded and unsavoury characters in one place , the overriding aspect of most of the comments are (a) the lies they peddle as truth its constant & (b) the illusion they have of being wanted by the people in the south who have a totally different outlook on things and would normally support a tory government and everything they do , just like England the tory supporters in Scotland are out of step with the majority of people in this country thats why they haven’t risen above even Thatchers approval ratings long may it continue we dont need anymore nuts here , after all we are saddled with Labour . The Scotsmans comments page is infested by the Cybritnat goon squad. I’m pretty sure they are a centrally organised bunch (just like the letter writing people) with few of them actually living here. It lets us know the calibre of our foes without having to watch Question Time. You could only vote once, I was curious so tried. If that is the case for all then the result for the yoonionists isn’t good and is probably why they are so incadesent with rage as, if Indy supporters couldn’t vote more than once, then neither could the Yoons. Poor show for the “silent majority” if they couldn’t even win one of their own poles.